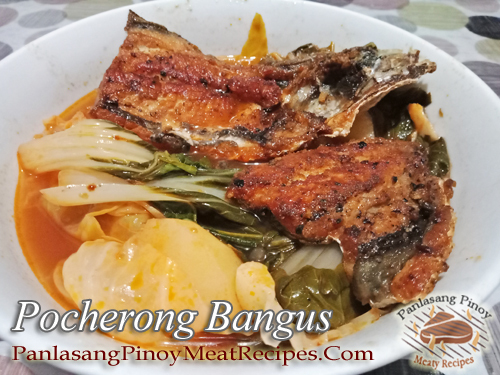 A tasty and healthy pochero dish that is easy to prepare and and to cook because you will be using bangus instead of pork. In this recipe, instead of using the ordinary bangus, you need to use boneless bangus or bangus belly. Its because it is more convenient to eat boneless bangus than having to to remove the spiny fish bones while eating this pochero. Other kinds of fish can also be used aside from bangus but be sure you only use fish fillet. Prepare the bangus by dividing each fish into four pieces. Season with salt and pepper and fry in hot oil until golden brown. Set aside. Fry the sweet potatoes and saba bananas too until brown and cooked. Set aside. Heat cooking oil in a pan and saute garlic and onion until fragrant. Add in the tomato paste and stir for minute then add water. Bring to a boil and add the sweet potatoes, saba bananas, green beans and pechay. Season with salt and pepper and let it simmer for 2 minutes and cover. Then add the fried bangus and simmer for a minute and turn off heat. Serve hot and enjoy!